Several churches in Chile have been attacked or vandalised ahead of a visit by Pope Francis next week. 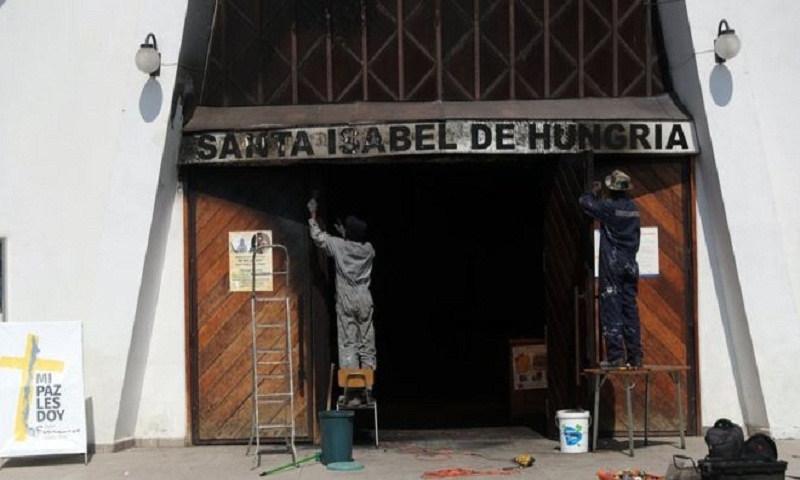 Three churches in the capital Santiago were damaged by firebombs. Some flyers left behind warned that the next one was for the Pope. But at another church south of the capital, a pamphlet used a phrase that refers to activism in the indigenous Mapuche territory. President Michelle Bachelet described the incidents as "very strange". No one has been arrested for the attacks, which caused no injuries. The Vatican is yet to comment. Pope Francis has made compassion and support for migrants and the needy a major theme of his papacy. But notes left at one of the attacked churches reportedly complained that money spent on his visit could be better used on the poor. The Pope will hold mass on Tuesday in a Santiago park and hundreds of thousands of people are expected to turn out. The pontiff will also meet Mapuche leaders on his visit to Chile. They say vast privately owned estates and huge timber plantations have left their lands in the extreme south of Chile environmentally depleted and their people mired in poverty, says BBC World Service Americas Editor Candace Piette. The pontiff, the first Latin American Pope, will travel to Peru after Chile, reports BBC.